As a nephrologist, he tends to patients whose failing kidneys sometime signal a somber future, yet he infuses them with hope. He spends 12-14 hour days interacting with people, yet craves the peace and solitude of his carefully-tended rose garden. "I bet there haven't been 10 people sit in this living room, at least with me," he said, late one afternoon this past month. "I'm a loner." Hervy Hiner, Jr, 51, is very much the product of a middle-class childhood spent in rural Pittsburg, Texas, about 45 minutes north of Longview. His parents were educators: Hervy Hiner, Sr. taught agriculture and Annie Beatrice Jones Hiner taught home economics. From his mother, who enforced discipline, he developed an appreciation for design and surroundings pleasing to the eye. From his father, he learned compassion, tolerance and a strong work ethic. He spent a lot of time helping his father on their small ranch, raising polled Hereford cattle and showing them in 4-H projects. In a farming community that was close to 50 percent black, Hiner learned about prejudice, both race and economic-based. Like his father, he formed friendships with people of all races and backgrounds. "My father was a very kind person," Hiner said. "Some people are suspicious about people until they spend time with them and get to know them. He was just the opposite. You pretty much had his trust and openness right up front. If you trust people and expect the best from them, if you are fair and give them the benefit of the doubt, it doesn't always work out, but you can't let those few dissuade you." Hiner took his share of ribbing about being a young black man showing cattle. "There weren't that many kids interested in agriculture unless they had family farms. Even if you lived in the country, you did not want to be perceived as rural or country. Some of my friends didn't want to hang out with me because of what I did, especially when we visited cousins in Dallas. It was something that was just not cool." Black doctors were rare in the area. Veterinarians were even more scarce. Families with livestock and pets often sought out Hiner's father, the closest thing to a vet they had. "People would come to him in the middle of the night and bring their dogs, or a cow might be having trouble calving. With his personality, he was always willing to help out, not for pay, but to help neighbors." Hiner, who often accompanied his father on those runs, developed a love of animals and a compassion for suffering of any kind. He wanted to be a veterinarian, but a respected aunt steered him toward medicine, saying the need was greater. The Baylor College of Medicine graduate eyed internal medicine, but ended up in a demanding specialty that makes the most of his personality. "I ended up in nephrology (the science of kidney functions and disease) because everybody hated it. I figured there had to be a need for it." Chronic kidney disease brings an entire set of problems, and patients can be more difficult to deal with, he said. "When people get to the point they need dialysis, that's a life-changing experience. It affects family members as well. It puts a horrible burden on their mental state." Hiner's patients, like 65-year-old Margaret Oubre who has been in renal failure and had two kidney transplants, say he takes the time to explain their condition and answer questions. "He's kind, compassionate and he listens. He'll return my calls himself. I can count on him," said the Port Arthur resident. Hiner, who is medical director for four Southeast Texas kidney centers, carries a pager and two cell phones. One is for his medical practice; the other is for a restaurant he opened despite knowing very little about the business. Every city has its signature restaurants, with a location, décor, or menu so distinctive they quickly become classics. 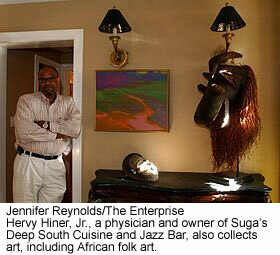 Hiner hopes diners who pursue such places will choose Suga's Deep South Cuisine and Jazz Bar. "I was going to be the landlord," Hiner laughed. During numerous revisions to the plans and restoration demands, businessman Joe G. Perl, an advocate for revitalizing Beaumont's historic downtown, called Hiner and encouraged him to develop the project. "He said, 'I'm glad you bought the Coale building. Beaumont really needs a place like this.' That stuck in my mind," Hiner said. "I wasn't too anxious to go into the restaurant business, which is high risk. I don't know if it was the challenge, or what Joe Perl told me, but I just could not put it down. Every time I tried, it would say, 'Come back.' I just got tired of fighting it. I thought, there must be something God wants me to learn." "He's very shy and very introverted," Rosalind Hall said. "When he said he was going to open a restaurant and club, I said 'What? You're kidding.'" Now, the man she describes as "devoted to his children and his patients" has a new love. The 1914 building has become a showcase pairing a restaurant and jazz bar filled with his passion - art. It wouldn't be hard to mistake general manager Rod Weatherly, of Port Arthur, Hiner's brother-in-law and the face of Suga's, as the owner. Hiner, who prefers to work behind the scenes, takes advantage of Weatherly's gregariousness. Although Hiner often visits the restaurant, it usually isn't to greet patrons. He prefers to spend time with the staff, helping him attend to details the perfectionist in him notices. He supports several charities and organizations through fundraisers, including the National Kidney Foundation. He also sponsors youth sports teams. Ginger Brown, 56, of Houston, who supervises Fresenius Medical Services four kidney centers in Southeast Texas, said Hiner is "the best nephrologists I've ever met." Hiner not only is a good physician, but a good man, she said. "He's kind and gentle. I have yet to hear him raise his voice. He's a softie, but it's by choice. If he wants to stand firm, he's as solid as a rock." Hiner's reputation as a loner is accurate, she said. "He doesn't get out and mix and mingle and go to parties. He's not into the social life. If he goes for a drink at social hour prior to a meeting, it's because it's requested or expected." Hiner's social graces are intact, she said of the "good conversationalist who can hold his own on just about any subject" and who has a dry sense of humor displayed at the most unexpected moments. Hiner's office nurse, Nettie Livings, describes Hiner as a "brilliant, dedicated doctor who has empathy for everybody" without regard for race or creed. "He's a wonderful person. He'll laugh and talk with you but he's low key. He doesn't isolate himself, but he doesn't seek attention. He minds his own business," Livings, 68, of Port Arthur said. "In all the years I've known, I've never seen him angry. Everyone who works for him says it's the best job they've ever had."